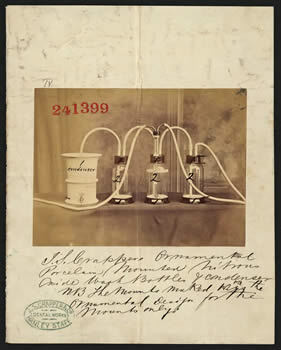 J S Crapper Ornamental Porcelain mounted Nitrous Oxide Wash Bottles & condenser. NB the mounts marked 1&2 the ornamental design for the mounts only [sic]. This apparatus was for use in the cleaning of the anaesthetic gas, nitrous oxide, used by dentists.